The London Film Festival is a marathon event where you try and pack in as many films as you can, pausing only to refuel. But this year, I've done something I've never done before: seen the same film twice. 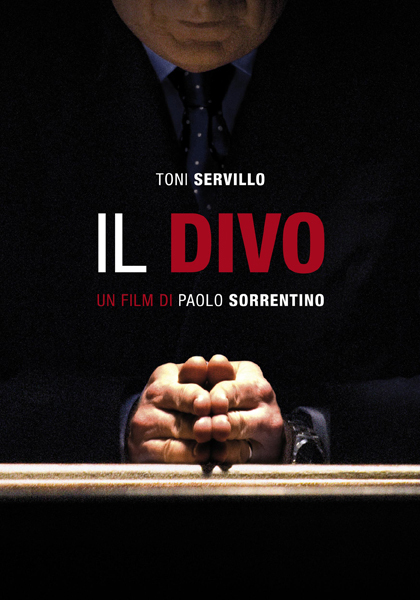 I knew that there was a high probability I was going to love Paolo Sorrentino's IL DIVO before I saw it the first time. His sinister, darkly comic, bizarre film THE FAMILY FRIEND was on my "Best Of" list in 2007, and I am fascinated by the grand macchiavellian figures of modern politics. What better, then, than a Sorrentino treatment of the political career of Giulio Andreotti - seven times prime minister of Italy, famously accused of colluding with the mafia and the masonic P2 lodge? The reviews were wildly enthusiastic, and the movie had already won the Prix du Jury at Cannes. Still, for all my anticipation, I could not have predicted just how strong my reaction would be. IL DIVO is simply a tremendous film that takes the raw subject matter of political biography and presents it with imagination, wit and a holistic view of Andreotti as a symbol of the endemic corruption of the Italian elite. Take an early scene when Andreotti has become premier once more and is on the verge of attempting to take the Presidency. The Andreotti faction of the Christian Democrats is at the height of its power and flush with success. Inside parliament a massive party is raging, with African music playing and ministers of state dancing manically. It's a wild display of power and ownership. Italy is their plaything. Power is a right. Why trust to luck - to mere democracy, when you can negotiate votes from mafia-controlled regions? "I don't believe in chance, I believe in the will of God." Meanwhile, Andreotti is in a back room, holding court, sipping his ubiquitous alka selzter. The central performance from Toni Servillo is masterful. He has been physically transformed into the ageing politician with the corners of his ears turned down, the large glasses, the hunched back, the repressed, closed gait and the sly smiles. Even when he falls under accusation of being complicit in the death of Aldo Moro and having symbolically kissed mafia boss of bosses Tony Riina, Andreotti always seems in control and, in a macabre way, amused by the game. More seriously, he uses the same slippery arguments that we hear from hard-line politicians everywhere: it takes a truly good man, truly concerned with the good of his country, to be able to consort with sinners and perpetrate evil acts. The ambiguity and mystery at the centre of this film is whether a man as intelligent and as conscious of irony as Andreotti would really believe such a statement or just like the sound of it. Maybe it doesn't matter. To quote Andreotti, "We learn from the Gospel that when they asked Jesus what truth was, he did not reply." Even bad films can contain great performances. Frank Langella was superb in FROST/NIXON playing a similarly despised, conflicted, mired politician who thought he was a "good" man. But the surrounding film was clumsy and superficial. Nixon's downfall was shoe-horned into a Hollywood story about a hero fighting evil against all odds, and with everything to lose. By contrast, IL DIVO is a brilliant film because it puts Andreotti in the context of Italian politics - with a cast of oddballs equally as interesting as the protagonist. Moreover, Sorrentino chooses a technique to tell his story that's as ambiguous, complicated and darkly comic as the subject matter. Indeed, in its complicated elliptic structure, its visual stylings and its playful use of sound-track, IL DIVO is one of the most technically audacious movies I have seen in a while. Take for instance a scene where the newly re-elected Andreotti enters parliament, walking through grandiose halls, to an internal sound-track of pompous classical music. A cat meows, the sound-track comes to an abrupt halt, and Andreotti stares down the cat. The cat moves, the sound-track restarts and Andreotti's triumphal march continues. How better could one illustrate the idea that these men were playing out a sort of egomaniacal fantasy of wealth and privilege, despite their often humble upbringing? IL DIVO repays multiple viewings. I'd go further and say that it actually requires them. If you're not completely familiar with Italian politics, and I'm certainly not, then on the first viewing you're hanging on to your seat trying to keep up with the machinations of the various characters. It takes a second viewing to be able to see through the headlines, into the deep, rich world of Italian politics behind them and to be able to more fully appreciate the directorial choice. Like I said, I've seen this film twice now and I can't wait to see it again. IL DIVO played Cannes 2008, where it won the Jury Prize, Toronto and London. It opened earluer this year in Italy and opens in France on December 31st. It opens in the UK on January 23rd and in the Netherlands on February 26th.